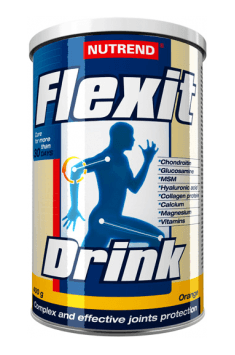 Flexit drink – a preventive and regenerative system for connective (joints, articular capsules, cartilages, tendons, ligaments…) and bone tissue. A complex composition set according to the latest clinical knowledge is a precondition for the effective functioning. Chondroitine sulfate – a basic building block for connective tissues formation and repair. Its sufficiency protects cartilage from destruction and damage. Scientific studies showed that chondroitin sulfate is a natural, alternative nutritional supplement for arthrosis. The addition of selected effective substances considerably improves effectiveness of gelatin hydrolysate and chondroitin sulfate and finishes the highly effective composition of the product. MSM (methylsulfonylmethane) – an organic sulfur compound, which is commonly present in human body. It participates in formation of collagen fiber structure. Due to its antioxidant activity it assists in protection of cartilage from damage caused by free radicals. Sulfur in MSM helps form basic amino acids like methionine and cysteine. brałem lepsze środki na stawy. Fajnie, że w proszku, smaki nawet ok.
Jest Najlepszy produkt na stawy! Już po 2 opakowaniach czułem się jak nowonarodzony. Wszystkie kontuzje ten produkt pomógł mi wyleczyć! Dissolve one portion of the product (20 g) in 200-300 ml of water and mix. Preventively: 10g in the morning on an empty stomach. In increased burden and connective tissue degeneration: 20 g in the morning on an empty stomach. It is worth to wait around 15 minutes after mixing and drink when the solution reaches gel consistency. In such a way we will obtain the maximum benefits. The time of application should not be shorter than 2 months. NUTREND is a Czech manufacturer of nutritional supplements and diet supplements for athletes that have gained immense popularity also outside Europe. In the wide range of the company products there can be found energy drinks produced on the basis of artesian water, protein and carbohydrate supplements. Also noteworthy are fat burners, the regeneration of joints supplements, hydrating and vitamin supplements. All products are made from carefully selected ingredients. Grapefruit: gelatine hydrolyzate, maltodextrin, calcium gluconate, magnesium gluconate, L‑proline, glucosamine sulphate potassium salt (origin in shellfish), acidity regulator citric acid, MSM (methylsulfonylmethane), chondroitin sulfate, aroma, vitamin C (L‑ascorbic acid), acidity regulator malic acid, anti-caking agents calcium phosphate and silica, sweeteners acesulfame K and sucralose, hyaluronic acid (sodium salt), aroma naringin, vitamin B6 (pyridoxine hydrochloride), vitamin D3 (cholecalciferol). Contains allergen: crustacean. Product may contain traces of soya and milk protein. Orange: gelatine hydrolyzate, maltodextrin, calcium gluconate, magnesium gluconate, aroma, L‑proline, glucosamine sulphate potassium salt (origin in shellfish), acidity regulator citric acid, MSM (methylsulfonylmethane), chondroitin sulfate, vitamin C (L‑ascorbic acid), acidity regulator malic acid, anti-caking agents calcium phosphate and silica, sweeteners acesulfame K and sucralose, hyaluronic acid (sodium salt), vitamin B6 (pyridoxine hydrochloride), vitamin D3 (cholecalciferol), colouring agent beta-carotene. Contains allergen: crustacean. Product may contain traces of soya and milk protein. Peach: gelatine hydrolyzate, maltodextrin, calcium gluconate, magnesium gluconate, aroma, L‑proline, glucosamine sulphate potassium salt (origin in shellfish), acidity regulator citric acid, MSM (methylsulfonylmethane), chondroitin sulfate, vitamin C (L‑ascorbic acid), acidity regulator malic acid, anti-caking agents calcium phosphate and silica, sweeteners acesulfame K and sucralose, hyaluronic acid (sodium salt), colouring agent carmine, vitamin B6 (pyridoxine hydrochloride), vitamin D3 (cholecalciferol), colouring agent beta-carotene. Contains allergen: crustacean. Product may contain traces of soya and milk protein. Strawberry: gelatine hydrolyzate, maltodextrin, calcium gluconate, magnesium gluconate, L‑proline, glucosamine sulphate potassium salt (origin in shellfish), acidity regulator citric acid, aroma, MSM (methylsulfonylmethane), chondroitin sulfate, vitamin C (L‑ascorbic acid), acidity regulator malic acid, anti-caking agents calcium phosphate and silica, sweeteners acesulfame K and sucralose, colouring agent carmine, hyaluronic acid (sodium salt), vitamin B6 (pyridoxine hydrochloride), vitamin D3 (cholecalciferol). Contains allergen: crustacean. Product may contain traces of soya and milk protein.